The $220 million incentive deal to keep Sikorsky in Stratford does much more than just enrich an already flush-with-cash helicopter manufacturer. The agreement is designed to also provide a boost to the suppliers who provide components and parts for the helicopters across Connecticut. One of those companies is Cambridge Specialty, that makes parts specifically for the new King Stallion. Tony Ouellette has worked at Cambridge for six years, after spending eighteen years at Pratt and Whitney. He says the news about Sikorsky provides even more security for his family, but also optimism for the next generation of workers in advanced manufacturing. Governor Dannel Malloy toured Cambridge Specialty Friday morning. He said the Sikorsky deal is a "no brainer" because of how it benefits so many companies in Connecticut. The deal mandates that Sikorsky spend $11 billion on payroll and $6 billion on Connecticut suppliers. There is also a sales tax exemption on supplies purchased from Connecticut companies. Another benefactor of the news is seven of Connecticut's community colleges. They have programs specifically designed for workforce training at employers like Sikorsky, Pratt and Whitney, and Electric Boat. The program costs $7,500 for the two semester course, and financial aid packages are available for students who qualify. 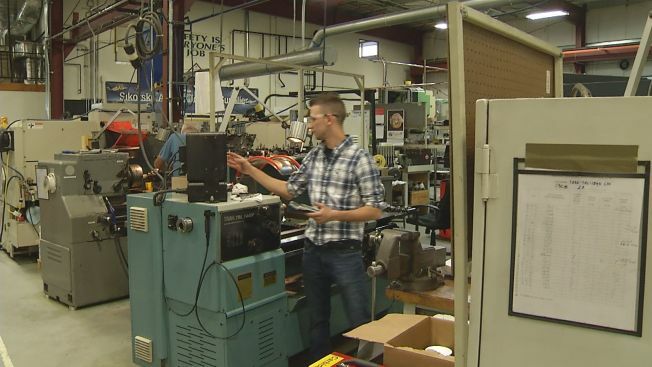 The lab at Naugatuck Valley Community College looks more like the work floor at Cambridge Specialty than at a community college, with special machines for production dotting the room. Scott Matta, 52, is trying to start a second career with an education at NVCC. “I’m hoping to get out into the work field and do 20 years,” he said during an interview Friday. He drove trucks in Bristol and Southington for 30 years and health issues forced him to change careers. He hopes there's something waiting for him when he graduates at a place like Pratt, which announced last week it would hire as many as 8,000 new employees to work in Connecticut over the next decade or so. The General Assembly is expected to vote on the Sikorsky package on Wednesday. Democrats in the House have already said they have the votes to pass it.